I know the first page many readers of The Irish Times turn to is the one with the announcements of Births, Marriages and Deaths. And, indeed, one of the primary sources for genealogists, especially at the beginning of a genealogical project, is the wealth of parish registers containing records of these three key life events. I say “hunters and gatherers” but that is disparaging. The recent debate about making the Civil Records of Births, Marriages and Deaths show that those who expressed concerns about privacy see genealogy as merely a matter of collecting the names addresses and vital dates of dead ancestors, without context or without gaining social insights and understandings. He affirmed the common assumption that a genealogy site is “for looking up your ancestors who are dead.” He realised the genealogy database potentially allowed them to find “a whole lot of information.” But of course it did – genealogy is about more than the names of dead people and the dates of their births, marriages and deaths. Church records help us to go beyond merely collecting and harvesting the names and vital dates of ancestors. Once we go beyond the names and dates available in the church registers, we open ourselves to the opportunity of entering a world of past generations, learning about their social networks, their living conditions, their political values, their social concerns and priorities, and the multiple layers of religious and ethnic mixes that have helped to make us the people we are in Ireland today. 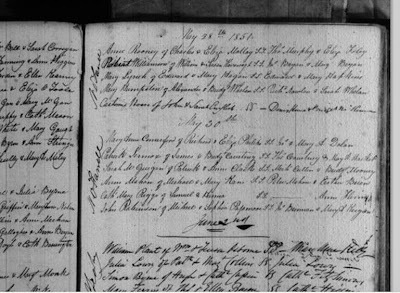 Drawing on parish records that include the Registers and Births, Marriages and Deaths, but moving beyond them, I would like to introduce a number of examples that might help to inform and expand our approach to genealogy. Parish records need to be treated with caution. 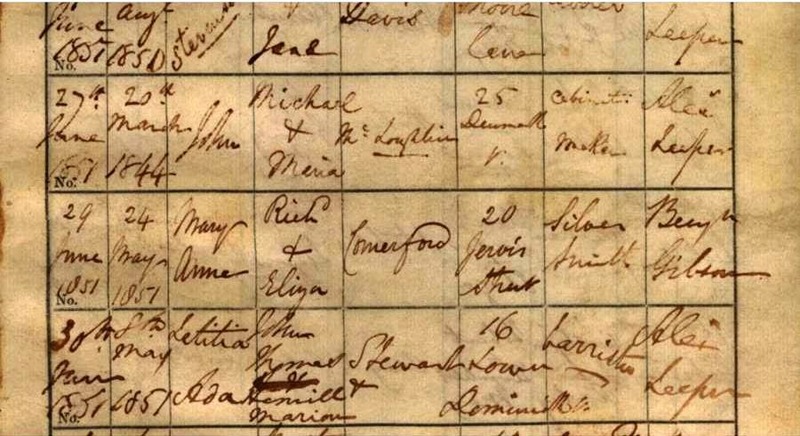 The spelling of surnames was often decided not by the parents of a child being baptised or by the couple getting married but by the parish filling out the parish register. Sometimes this was the parish priest or rector, at other times it was the parish clerk or sexton. In case of the clergy, they often thought better of how a name should be spelt, or misunderstood the accents of many people who were less educated than they were. In the case of first names, given names or baptismal names, there was a fashion among the Victorian Roman Catholic priests of this city of entering them in Latin, which leaves you wondering whether Anna was known in her family as Ann, Anne, Anna, or perhaps Anna, or Maria as Mary or Maria. Jacobus was almost always James, but just occasionally, once every now and then, he might have been Jacob. 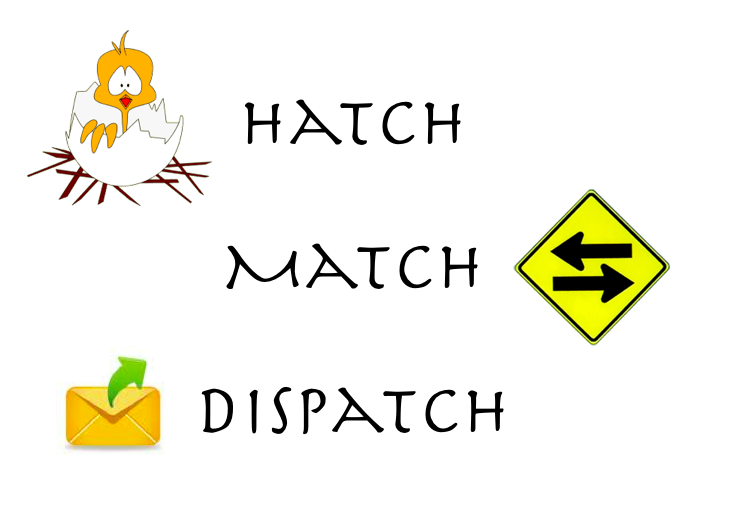 Some registers are great at giving a mother’s maiden name, or the names of the parents of a couple getting married. In other parishes they seemed not to bother as long as they were satisfied that the canonical and legal requirement were met. The same happens with the names of sponsors, witnesses, godparents, bridesmaids, whatever name is used according to time and tradition. And is some cases, the name is wrong, simply and plainly, and you have to know the name to track the record – which, for genealogists, is like trying to find the egg before it is laid, or eating the cake before it is baked. For example, I was looking for the baptismal records of Charles William Comerford (1877-post 1911). It was a search worth pursuing, for Charles Comerford, who was living in Kenilworth Square at the time of the 1911 census, was a telegraphist in the GPO, and I am still pursuing a search to see if he was working in the GPO in 1916 – the workers in the GPO are a forgotten group whose stories need to be told during this series of centenary commemorations. The search was complicated, not only because of mistaken surnames and mispelled surnames, but because Charles was born in 1877 and was baptised almost a year later in 1878. I had to use my imagination in my search. Eventually, I found that Charles, who was born on 28 February 1877, was baptised 31 January 1878, Saint Peter’s Church of Ireland, Aungier Street, However, the baptismal register only gives his mother’s maiden name, spelling it as Hannah Jordon, and mistakenly, by omission, giving the name Jordon to both parents. The church was closed in the 1970s, and later demolished, but I have a few other stories from Saint Peter’s if we have enough time this afternoon. Parish registers tell us that the distinction between “Catholic Ireland” and “Protestant Ireland” has never been very clear, and the false lines that we have drawn in the past century were virtually unknown or certainly ignored regularly in Dublin in the 18th and 19th century. We all know stories of how members of the Church of Ireland in Wexford had themselves baptised in the Roman Catholic parish in 1798 in the hope that this would guarantee their safety and security during the 1798 Rising. But the Wexford historian Celestine Murphy has searched extensively in the records of both traditions, and has found a far more frequent occurrence of double baptisms, taking place in both parishes. Wexford is a good case study for this, because the Roman Catholic records, although patchy in places go back to the late 17th or early 18th century. It is a theologian’s nightmare, because, of course, all mainstream Churches accept today that there is only one baptism and there is no such thing – or ought not to be – as rebaptism. Any notions that these double baptisms may be about preserving land inheritance rights under Penal Laws fade away once realise that this occurrence can be found regularly in urban areas, and long after the Penal Laws have been abolished, well into the late 19th century. Again let me give you some examples from Comerford family stories. Let me return to stories from the Comerford family as examples that are easy for me to illustrate. 1, William Comerford (ca 1842/1843-post 1901), Charles Comerford’s father, whose baptism I have not yet been able to trace. 2, James Comerford (1843-post 1857), born 1843, baptised in Saint Nicholas of Myra Roman Catholic Church on 18 May 1857. His late baptism at the age of 14 may indicate that he was already baptised as an infant in a Church of Ireland parish church. 3, Eliza Comerford (1849- ), born 25 June 1849?, but baptised in Saint Michael and John (Roman Catholic) Church, on 24 May 1849 (sponsor Eliza Phillips) and in Saint Mary’s Church of Ireland Church, Dublin, on 12 August 1849. 4, Mary Anne Comerford (1851- ), born 24 May 1851, and baptised in Saint Mary’s Church (Church of Ireland) on 29 June 1851 by the curate, the Revd Benjamin Gibson, and in Saint Nicholas Church of Myra Church (Roman Catholic) a day later on 30 May 1851 by Father N O’Farrell (sponsors: John Dolan, Mary A…). This is not a case of every second child being baptised in one church or the other, nor is it an example of the boys being brought up in one church and the girls in the other. So what about the eldest child, William, whose baptism I am still trying to trace? What did he do with his children? William Comerford (ca 1842/1843-1907), was an heraldic engraver, and living at 24 Whitefriar Street (1864); 2 Montague Street (1866); 29 Upper Camden Street (1870, 1871); Clanbrassil Street (1873); and finally 18 Parnell Place, Rathmines (now Parnell Road, Harold’s Cross), Dublin (1877, 1879, 1890, 1901, 1907). The parish registers for his marriage and the baptism of his children help to track the various houses he moved to over a life span of 65 years, and the census returns on 31 March 1901 help to pinpoint his age at the time, 58. On 29 September 1862, William was married in Saint Audeon’s Church of Ireland Church, Dublin, to Hannah Jordan, daughter of John Jordan, accountant, of 3 Lower Bridge Street, Dublin (witnesses, James Smyth and Mary Murphy). He died at 18 Parnell Place, Harold’s Cross, on 28 May 1907, and administration was granted to his sons Charles W Comerford and Joseph C Comerford. 1, Elizabeth, born 30 October 1864, baptised 23 February 1865, Saint Kevin’s Roman Catholic Church, Harrington Street (sponsors: Henry Jordan, Mary O’Brien). She was married on 5 November 1890, in Saint Catherine’s Church of Ireland Church, Dublin, to James Harvey, a bandmaster in North Lancashire Regiment, son of James Harvey, foreman in London Clocks (witnesses William Carsy and William Comerford). 2, Mary Christina, born 28 December 1866, was baptised 25 January 1867 in Saint Kevin’s Roman Catholic Church, Harrington Street (sponsors: James Comerford, Catherine Shaw); she was single and aged 35 in 1901. 3, Richard Henry Comerford (1870- ), was born 1 June 1870, and baptised 7 June 1870, Saint Kevin’s Roman Catholic Church, Harrington Street (sponsors: Richard Comerford, Anne Mullin). 4, John William Comerford (1871- ), born 10 May 1871, was baptised 27 June 1871, Saint Kevin’s Roman Catholic Church, Harrington Street (sponsors: John and Susan Jordan). 5, Susan, born 18 March 1873, was baptised 30 March 1873 in Rathmines Roman Catholic Church (sponsors: George Jordan, Mary Anne Backen), aged 27 in 1901. 6, Charles William Comerford (1877-post 1911), born 28 February 1877, was baptised 31 January 1878, Saint Peter’s Church of Ireland, Aungier Street (note, the baptismal register only gives his mother’s maiden name, misspelled as Jordon, and omits his father’s surname). 7, Joseph Henry Comerford (1879-post 1907), later an heraldic engraver, was born on 28 February 1879, baptised 7 August 1879, Saint Peter’s Church of Ireland Church, Aungier Street, Dublin, by the Revd Robert William Buckley, curate of Saint Peter’s and Rathmines, and organising secretary of SPG Ireland (Society for the Propagation of the Gospel). Joseph Comerford was aged 22 in 1901 and living with his father’s family. So for this couple, who were married in the Church of Ireland, seven children, four daughters and one son, were baptised in the Roman Catholic churches, and the two younger sons were baptised in a Church of Ireland parish church. Yet, the marriages that I have tracked for two of these children take place in Church of Ireland parish churches. Quite a heady mix, indeed. On 9 June 1910, Charles Comerford married Adelaide Margaret Field, daughter of John E. Field, solicitor’s clerk, of 39 Longwood Avenue, South Circular Road, Dublin, and his wife, Elizabeth Mary (née Doyle, daughter of William Doyle of 53 Lower Clanbrassil Street). John and Margaret Field were married on 14 April 1868 in Saint Luke’s Church, Dublin. Adelaide was born on 18 February 1878, and baptised by the Revd RW Buckley in Saint Peter’s Church on 23 April 1878. In the census returns in 1911, they both declared they were born in Dublin and members of the Church of Ireland. The confusion is compounded by the legal position that, at least until disestablishment, it was legally possible to have a marriage declared invalid to have it annulled if one of the parties was a member of the Church of Ireland and the wedding was conducted by a Roman Catholic priest. William Charles Yelverton, 4th Viscount Avonmore (1824-1883), became part of Irish legal history while he was Major William Charles Yelverton and before he succeeded to his family titles. On 15 August 1857, he married his first wife, Maria Theresa Longworth, after Mass on 15 August 1857 in the parish church of Kilbroney near Rostrevor, Co Down. The couple explained a need for secrecy to the parish priest, Father Bernard Mooney, asking him not to enter details of their marriage in any public register, and he consented. They met in Crimea: he was an officer decorated in the Crimean War, she a nurse at Balaclava who had become a Roman Catholic as a consequence of her convent school education in France. Less than a year later, while Maria was still alive, he married his second wife, Mrs Emily Marianne Forbes (née Ashworth), widow of Professor Edward Forbes, on 26 June 1858, in Trinity Chapel, Edinburgh. The validity of his first marriage was then tested in the Yelverton case, a 19th century Irish law case that eventually brought about a change in the law on “mixed marriages” in Ireland. Under a Statute of King George II (19 George II, c. 13), any marriage between a Roman Catholic and a Protestant or a marriage between two Protestants celebrated by a Roman Catholic priest was null and void. Between 21 February and 4 March 1861, the case of Thelwall v. Yelverton found that even though Major Yelverton was a Protestant, and Miss Longworth a Roman Catholic, and that they had been married by a Roman Catholic priest, the marriage was valid. Major Yelverton was court-martialled for conduct unbecoming an officer and a gentleman and suspended from military service. However, on appeal, the decision was reversed on 28 July 1864, when the House of Lords decided that his first marriage was illegal, and therefore his second marriage was valid. The case brought notoriety and created very mixed feelings. Theresa was alternately vilified and celebrated, portrayed as a victim who had been mercilessly abandoned and accused of being a lascivious seducer. Sometimes she was depicted as innocent and pure, at others as a ruthless social climber. After six years of trials and appeals, she finally lost her case, but in the process had become a minor celebrity. She died on 13 September 1881 in Pietermaritzburg in South Africa – and was buried in the Anglican cemetery. Meanwhile, William Charles Yelverton and his second wife Emily had four children, three of whom were born before the legality of their marriage was affirmed in the House of Lord, and two of whom succeeded in turn to the family titles: Barry Nugent Yelverton (1859-1885), 5th Viscount Avonmore; William Walter Aglionby Yelverton (1860-1861); Olive Ursula Yelverton (1861-1861); and Algernon William Yelverton (1866-1910), 6th Viscount Avonmore. Many members of the Yelverton family are commemorated in plaques and memorials in Rathfarnham Parish Church, and some are buried in the old churchyard in Rathfarnham village. The tight legal provisions, and the certainty that they could be enforced, in Ireland most “Catholic/Protestant” couples had a public ceremony performed by a Church of Ireland priests according to the rites of the Church of Ireland and then a renewal of marriage vows before a Roman Catholic priest. These discriminatory laws, indeed, meant that the Church of Ireland was safest place for people to marry if there was any possibility that the legality of a marriage might be questioned. 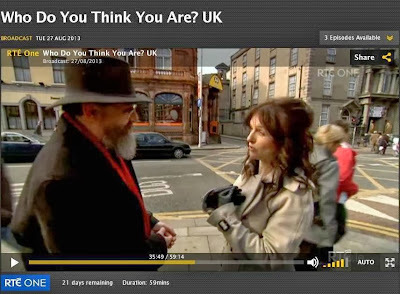 This explains, in part, the reason for the marriage of Dervla Kirwin’s ancestors, one Jewish the other Roman Catholic, in Saint Peter’s Church, Aungier Street, as I have explained on a much repeated edition of Who Do You Think You Are? Often what looks like a Church of Ireland marriage may simply be an effort to ensure all legalities have been met. And, of course, this does not explain patterns in baptisms, or the high incidence of double baptisms. Parish registers tell us a lot about the on-the-ground social ecumenism of the 19th century, and how many of our religious barriers have been constructed in families, I would suggest, since Ne Temere. But they also show that religious and ethnic pluralism begins far earlier than we think or imagine. Certainly, both Church of Ireland and Roman Catholic parish records indicates a Muslim presence in Ireland for longer than most of us imagine. In Saint Aidan’s Roman Catholic Cathedral, Co Wexford, the baptism of a “convert from Mahometanism” (sic) is recorded on 12 September 1853. In Saint Werburgh’s Church in inner-city Dublin there is a plaque recalling John Mulgrave, a captured black African slave who was rescued from the slave-trading ship after a shipwreck and brought by the Earl of Mulgrave to Dublin, where he died of smallpox. These church records challenge racism and Islamophobia in Ireland, and remind us that black and Muslim people have had a centuries-long, respectable and honorable presence in Ireland. When we are looking at parish registers, we need to look for more than names of the child being baptised and the child’s parents, or the name of the bride and groom and their parents. The sponsors at baptisms and the best man and bridesmaid are often chosen as ways of drawing a family back in together as the family is about to spread out further. William and Hannah Comerford consistently selected members of the Comerford and Jordan families as godparents for their children, no matter which church the baptisms were taking place in. Clergy often chose to turn a blind eye to the denominational loyalty of a particular witness or sponsor, as long as the baptism or wedding was going ahead. But names like these also can help identify brothers, sisters, cousins, whose names change at marriage, as you try to build a family tree that seeks to be both horizontal as well as vertical. And they also illustrate how ties of kinship can remain or even be reinforced despite growing social disparities. And they help to build up an image of the social and political ties that link families together. For example, when Suzanne (Susan) Mary Green was baptised in 1870 in Saint Andrew’s Church, Westland Row, Dublin, her sponsors were Richard and Power. 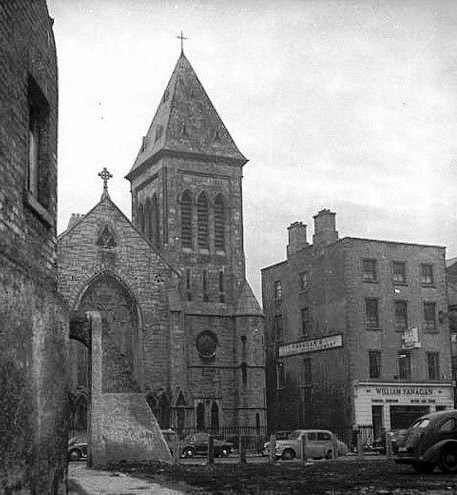 Westland Row was the fashionable Roman Catholic parish in Victorian Dublin. Suzanne’s brother, John Maxwell Sullivan (Max) Green (1864-1922), who was baptised in Saint Mary’s Pro-Cathedral, later married Johanna Redmond, younger daughter of John Redmond (1856-1918), the Home Rule Parliamentary leader. Baptisms and weddings in Dublin show the nexus that linked the Power distillery family and the Redmond political family from Wexford. Witnesses at weddings can help us trace more than we might first expect in family details. I had long thought the search for details about the family background of my great-grandmother was going to be a futile exercise. Anne Doyle was only 17 when she married my great-grandfather, James Comerford from Bunclody, Co Wexford, in 1851. I thought, perhaps, that, like James, Anne also came from Co Wexford, and had come to Dublin to marry him. I knew about one of her sisters, but the names Anne Doyle and Mary Doyle are so commonly found throughout Ireland that I imagined looking for their family story was going to be like looking for the proverbial needle in the proverbial haystack. To my delight, however, I uncovered Anne’s story in recent weeks. But in searching for her story I also found myself in search of the shortest street in Dublin. Anne Doyle was born 180 years ago in August 1834, the youngest of three daughters of Garret Doyle and his wife Mary (Byrne), who were living at 25 Cross Kevin Street. She was baptised on 25 August 1834 in the Church of Saint Nicholas of Myra in Francis Street. The parish records show she was baptised by Father James Roche, and the sponsors at her baptism were William Coffey and Bridget Reilly. Garret and Mary Doyle had two other daughters: Mary, who was baptised on 15 December 1828 in Saint Nicholas Church by Father James Roche and Eliza Doyle, who was baptised on 23 September 1831 in the same church (sponsors: James Dougherty, Mary Rood). I knew Anne’s later biographical details, the details of her marriage and children, the places she lived, including Stephen Street (1852), 22 Long Lane (until 1865) and 7 Redmond’s Hill (from 1866 until at least 1870), all within one-three minutes walk from Cross Kevin Street, until she moved to 2 Mountpleasant Villas, Ranelagh, where she died on 28 April 1899. Her widowed husband, my great-grandfather James Comerford, then moved into 11 Upper Beechwood Avenue, Ranelagh, where my grandfather was living, and there he died on 14 December 1902, aged 85. Her sister Mary was Anne’s bridesmaid, but I was really helped in confirming Anne’s identity when I found how she kept in touch with her childhood friends and neighbours – on 12 July 1859, she was a witness with Edward Sherwood at the marriage of Edward Connor of 28 Cross Kevin Street and Ann Raymond in Saint Nicholas Church. Her presence at that wedding and her connection with Cross Kevin Street clinched many of the details that confirm her identity. Witnesses and sponsors at a baptism or a wedding give us clues to who people were related to. But they also tell us about who they worked closely with, and illustrate patterns of migration. For example, there is a cluster of people with strong Co Wexford names occurring in baptisms in the Kevin Street, Camden Street and Clanbrassil Street area from the mid to late 19th century. They often felt safer socially by living close to one another, but they also helped each other find a place to live, a job to work at, and they thanked each other by asking them to be witnesses as baptisms or weddings. And, of course, they even inter-married. Here we see social patterns in these internal Irish migration from Co Wexford to Dublin that are similar too, for example, the social patterns in the external migration, the emigration, from Co Wexford to Argentina. How beneficial it would have been to social historians and genealogists had the churches also expected to have two sponsors or witnesses at funerals too! Sometimes, family members are taken aback and brought to blushes when they find that their great-grandparents were living at the same address when they married. But does not mean they were living together. Yes, of course there are cases where people cannot afford to marry, or refuse to marry, until there is a guarantee of a pregnancy and therefore a future generation, and that is not rare even in Victorian parishes. But often people in inner city Dublin, even people in respectable and fashionable crafts and trades, were living in cramped housing conditions. And sometimes living at the same address was a convenience, a postal address, a legal fiction that allowed them to marry in particular church because they were living within the bounds of a parish – the old “domicile” rule. This point was illustrated when in that episode of Who Do You Think You Are? with Dervla Kirwin. Her Jewish great-grandfather, Henry Kahn, and her Roman Catholic great-grandmother Teresa O’Shea, were married in Saint Peter’s Church, Aungier Street, in 1880. They both gave their address as 70 Aungier Street. The parish registers show the wedding service was conducted by the curate of Saint Peter’s, Canon Morgan Woodward Jellett (1832-1896), who became Rector of Saint Peter’s three years later. Dervla wanted to know why were married in a Church of Ireland parish church: Henry, who was then 24, was born a citizen of the Russian Czarist Empire, into a Jewish family in Suwalki in Russian Poland on 28 September 1855, while Teresa, who was born an Irish Catholic. But off camera I told Dervla how Henry was a cohen or member of the hereditary priest caste in Jewish society. To marry any woman outside Jewish society would exclude him for ever from full membership of the Jewish community in Dublin. Teresa, for her part, risked being excluded from Catholic society for marrying a Jewish man unless he first converted to Roman Catholicism. The shared address at 70 Aungier Street, whether it is a reality or a fiction, gave them the right as residents of the parish to ask to be married in Saint Peter’s when they could not be married in a Roman Catholic parish or in a Jewish ceremony. Antisemitism had not yet become a major social problem in Dublin: just four years before their marriage, Lewis Wormser Harris was elected Lord Mayor of Dublin in 1876 – although he died before taking office. But both were taking a major risk, so it must have been a true love match that involved enormous sacrifices. 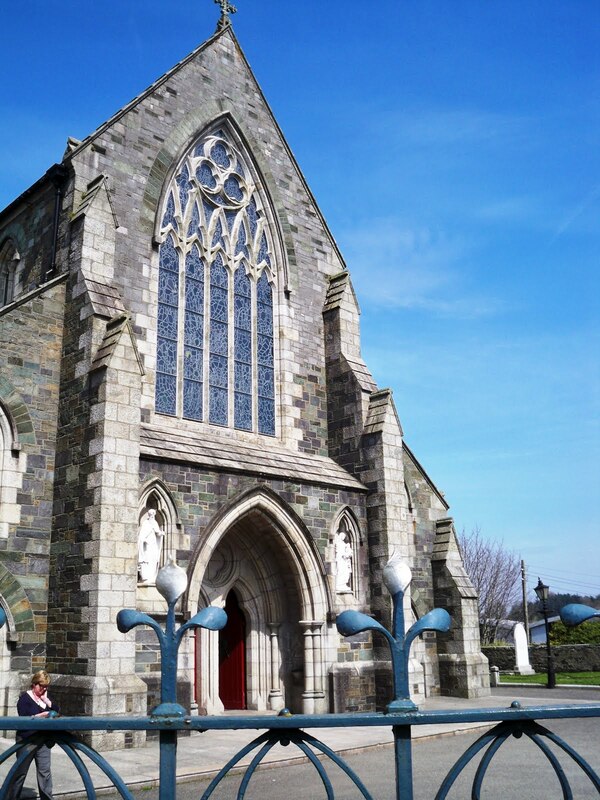 As residents of Saint Peter’s Parish, the Church of Ireland parish church provided the most convenient and most tolerant place for their wedding. Canon Morgan Jellett and the other curate in Saint Peter’s, the Revd John James MacSorley (1809-1884), were part of that High Church tradition in Anglicanism that gave us the slum priests, with an enlightened social awareness and engagement. Ten years after he and Teresa were married, Henry Kahn was baptised a Roman Catholic in Saint Michael’s and Saint John’s Church, Dublin, on his 35th birthday, 28 September 1890. A Latin inscription next to his name reads: “Adult baptism from Judaism.” He was naturalised two years later. thou mak’st the flowers grow. We might imagine the people who lived in the slums of inner city Dublin, and in the cramped and crowded conditions around Saint Patrick’s Cathedral, as people who might be left without written history, apart from folklore and the oral transmission of memory. It was a densely populated area. The proximity to the two cathedrals meant that in the mid-19th century there was a healthy mixture of Church of Ireland and Roman Catholic neighbours. The area included some of the worst slums and tenements in Dublin at the time, yet it was also an area associated with great creativity: the composer John Field (1782-1837) was born in Golden Lane and received his early education in Dublin before moving to London, where he studied under Muzio Clementi, the Rome-born composer and friend of Mozart. Later, in 1830, Clementi lived at Lyncroft House in Lichfield, now the Hedgehog Vintage Inn. Field died in Moscow seven years later, in 1837. He is remembered in a monument on the corner of Golden lane and Bride Street. But in my search for Anne (Doyle) Comerford’s identity, I found myself asking: where is Cross Kevin Street? Does it still exist? In my search I found Cross Kevin Street the week before last, and in the process came across what must be the shortest street in Dublin today. Cross Kevin Street can be no more than 20 metres long, and there are no buildings, no shops, no houses sharing this address, despite the one name sign identifying it. Cross Kevin Street links Bride Street with New Bride Street, and is within walking distance of Saint Patrick’s Cathedral. But the only building on the street today is a block of flats that faces Bishop Street on one side and Lower Kevin Street on the other side, with the street name sign on the side of the block of flats. Looking at the junction and the street sign this week, it was difficult to see how this had been a longer street in the time of Anne Doyle, when it had many more buildings, and two side streets or alleyways leading off it, Lamb’s Court and Fearon’s Court. However, a quick look at baptismal records in the local Church of Ireland and Roman Catholic parishes and at street directories and electoral rolls reveal the names of the many families who lived on Cross Kevin Street in the Victorian era: Allen, Bardock, Cahill, Connell, Connor, Dalton, Doyle, Edwards, Gill, Graham, Green, Greenfield, Harwood, Lamb, Lawless, McGuire, Macken, McKewing, Mulligan, Murphy, Pellen, Porter, Raymond and Wilson. Parish records help us to reclaim the memories of the lost streets of our city, and help us to reimagine them, to rebuild them in ours minds’ eyes. Church records beyond the parish registers remind us of the social conditions in the inner city. The monument to Thomas Abbott by the West Door of Christ Church Cathedral shows a weeping urchin and a funerary urn. This is not some romanticisation of the impoverished inhabitants in the streets beside the cathedral. Abbott was one of the founders of the Mendicity Institute, and died because he lived with and cared for the poor. 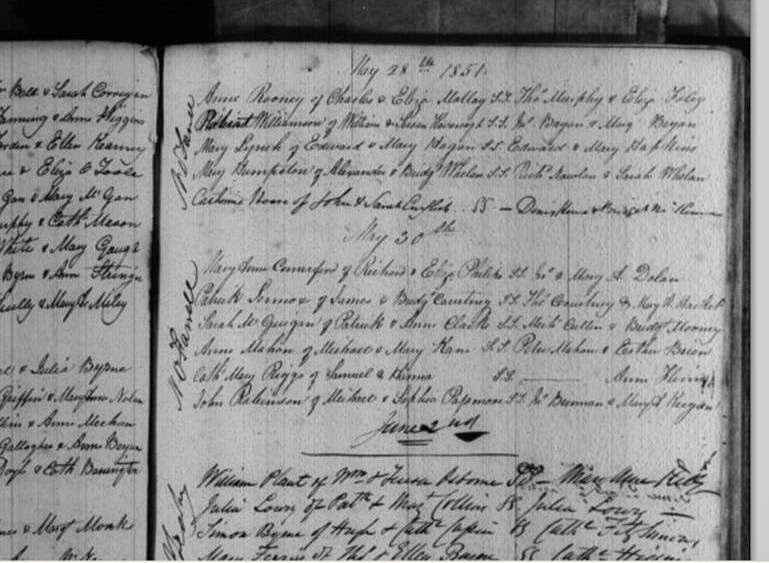 There is more to discover beyond births, marriages and deaths in parish records. For example, the vestry minutes in Church of Ireland parishes help us to trace many parishioners who do not necessarily feature in the births, marriages and deaths, and there is more to be found in Sunday School enrolment lists, parish subscription funds, the records of parish halls, and so on. Those closing words, “the secret scripture of the poor,” remind me that the secret history of the working class is often found in the churches built in the city centre in the 19th century. The labourers, as well as the craftsmen and the tradesmen, left their marks in their work in those buildings. The church was designed by AWN Pugin’s son, EW Pugin, and the stoneworkers, masons, carvers, stucco plasterers, carpenters, tilers, woodturners and stained-glass artists who worked on the churches in the Gothic Revival tradition, are often remembered and recorded in account books and other detailed books dating from their building. It was part of the way the Gothic revival architects worked, including the Pugins, Pierce, McCarthy, Ashlin and Coleman. I understand they may be found in Saint Kevin’s, John’s Lane, Saint Peter’s in Phibsborough, Mount Argus, Saint Aidan’s Cathedral, Enniscorthy, the Twin Churches (Bride Street and Rowe Street) in Wexford, and in many other churches. Because these trades were handed down from father to son, and from uncles to nephews, and because of inter-marriages between families, these records offer treasure troves that still await the exploration of intrepid, pioneering genealogists. 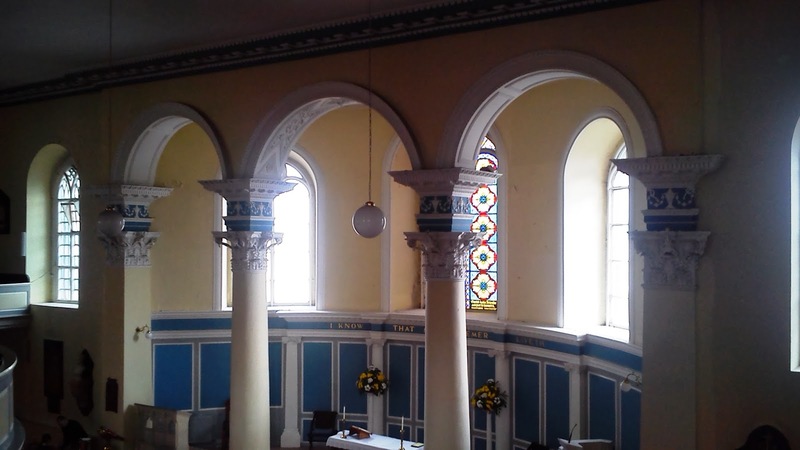 In Saint Catherine’s Church, Meath Street, the workers who carved the faces on the tops of the pillars or columns in the nave arches used the faces of each other (although one later, fresh face is said to be that of Kevin Barry). In this, they continued a tradition that began with Pugin in his masterpiece, Saint Giles’s Church in Cheadle in mid-Staffordshire. These workers lived in an interesting area from Camden Street across to Brunswick Street (now Pearse Street), often intermarried between families, and often travelled between Dublin and the English Midlands, leading to another potential study on migration and return migration in which parish records may be a crucial tool. In a conversation in Saint Patrick’s Cathedral last week with a former colleague, he asked why Roman Catholic churches did not have the same grand memorials that are seen in the parish churches of the Church of Ireland. But this is so only to a degree. Close to Saint Patrick’s Cathedral in south inner city Dublin, the Church of Saint Nicholas of Myra in Francis Street, the parish priest who was instrumental in the design, building and decoration of the church, Father Mathew Flanagan, brought in some of the great sculptors, painters and craftsmen in early and mid-19th century Dublin, but also left his own family tree around the church, including monuments in the north transept west wall to his mother, Mary Flanagan, and his brother, Stephen Flanagan, as well as a white marble sarcophagus on the east wall of the south transept. There are monuments in this church too with steles and mourning figures, draped urns to wealthy donors, including John Delaney of Air Park, Rathfarnham, and James Lawlor. But the fashionable Roman Catholic parish church in Dublin in the 19th century was Saint Andrew’s in Westland Row. There too we find some of the finest examples of memorials to the dead, including a stele with figure of Time and a woman reading to a small girl (Mary Farrell), other commemorative steles, and an armorial plaque (unusual in Roman Catholic churches) commemorating Lord and Lady Netterville. In the Pro-Cathedral in Marlborough Street, there are monuments to many prominent lay people, including one to William Purcell with an angel, a plough, a dog and several sheep ... well, he was a founding member of the Agricultural Improvement Society of Ireland. But the overwhelming majority of people could not afford monuments on this scale. They are remembered in brass plaques and plates on pews, which can often help us to name a married couple, or locate which parish they lived in. 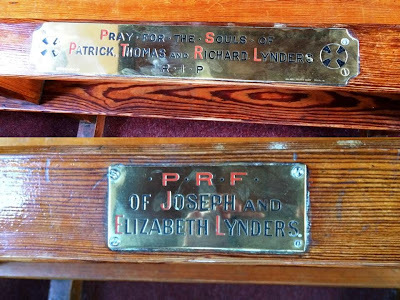 Looking at the brass plates on the pews in Saint Patrick’s Church, Donabate, I was helped in confirming the relationship between some members of my grandmother’s family, the Lynders family of Portrane, and I was reminded too of the names of some members of the family I might otherwise have not placed on the family tree. Brass plates on pews in Roman Catholic parish churches can tell the stories of social movements and tragic stories too. The brass plate for Sir James Power (1800–1877) on a pew in Saint Andrew’s Church, Westland Row, shows the shift of the fashionable middle class from the inner city near Saint Catherine’s Church to the area around Merrion Square. These brass plates can also lead us to social stories and stories of family tragedy. Sir Dominic Corrigan (1802–1880), the son of a Thomas Street dealer, became a celebrated figure in Irish medical history known for his pioneering work in heart disease. He lived in Merrion Square, and briefly was Liberal MP for Dublin. He is remembered with his wife, Joanna (Woodlock) on a brass plate in Saint Andrew’s, where they are buried in the crypt. His title was inherited by his grandson, Sir John Joseph Corrigan (1859–1883), but he died at the age of 23 and with him the family title died too. On another pew nearby, a brass plate remembers Sir Dominic Corrigan’s daughter, Mary, and son-in-law, Sir Richard Martin (1831–1901). It is interesting that on the Corrigan and Martin plates, the women are simply referred to by their title as Lady Corrigan and Lady Martin, without any personal, first name. Look too for the brass plates naming the donors of statues or altar rails at side chapels and side altars, placed beneath stained-glass windows, and the inscriptions on lecterns. Some of these monuments can list generations of family members sharing similar occupations. There is a single brass plaque in the north-west, Musicians’ Corner, in Christ Church Cathedral, remembering musicians and choristers in Christ Church Cathedral from the 1760s to the 1890s, a span of 130 years, perhaps four or five generations. Two architects, Thomas Greene and Sir Thomas Drew, and their families, are remembered side-by-side in brass plaques in niches in the north ambulatory in Christ Church Cathedral. Look too at the inscriptions on stained glass windows. The Power family of Edermine, Co Wexford, and Power’s Distillery, Dublin, funded much of the building programme in Saint Catherine’s Church, Meath Street, Dublin. And there are a number of discreet memorials to the Power family in the church, including a window commemorating Sir John Power. Often children who move away from a parish are anxious not to be forgotten, and so they donate windows in memory of their parents, but ensure their own names are inscribed too. My grandmother’s brother, Cornelius D. Crowley (1879-1972), of Finnstown House, Lucan, Co Dublin, and Roscrea, Co Tipperary, was originally from Millstreet, Co Cork. 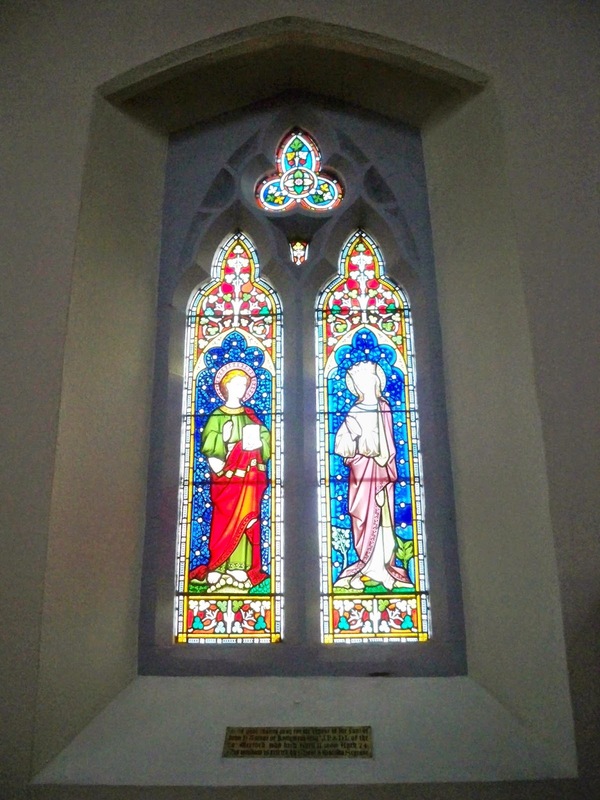 He was anxious to be remembered in his native Millstreet, and so in 1944 erected this window to his parents, Denis and Maria Crowley, in Saint Patrick’s Church, Millstreet, in 1944. When O’Neal and Matilda Segrave erected a window in Rowe Street Church in memory of AWN Pugin’s great patron in Wexford, John Hyacinth Talbot, were they commemorating him, or themselves? Once again, we have a pair of church memorials that help to draw the links in a nexus of families that includes the Talbots, Segraves, Powers, Redmond sand so on. Finally, as we are remembering the 100th anniversary of World War I, and many family are recovering family stories that it was regarded as politically expedient to forget after 1921, let me point to war memorials in churches as another genre of church records that can help genealogists trace forgotten family members. 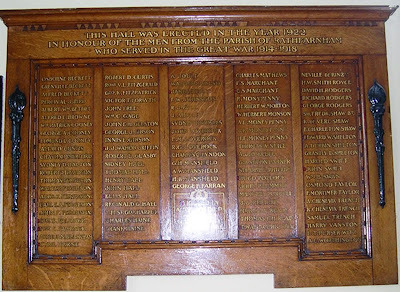 Some of the war memorials in parish churches are simple plaques in stone, brass or wood on the side walls of churches either to individuals or families, or groups, erected by family members or by parishioners. Others have become the first things you see as you enter a church or cathedrals, for example the elaborate war memorials carved into the south-west porch entrance in Saint Canice’s Cathedral, Kilkenny. 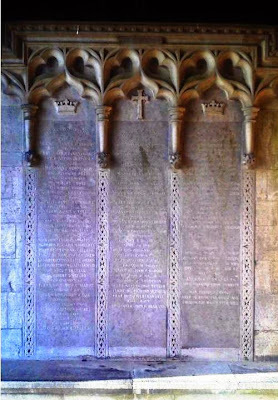 Saint Iberius’s Church (Church of Ireland), Wexford, may be unique in having the names of the parish war dead carved on panels on the pulpit. 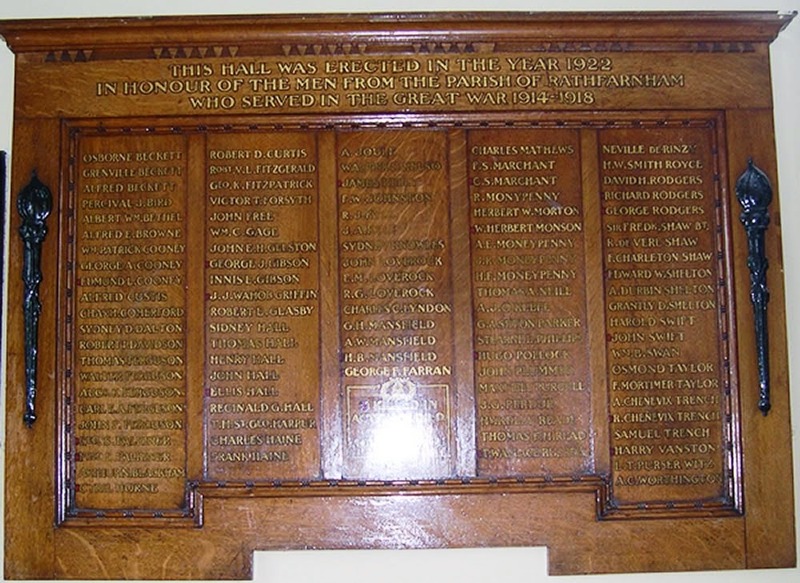 The Stringer-built War Memorial Hall on Rathfarnham Road contains a list of parishioners who fought in World War I. I presumed that, like most parish memorials, this was list of the parish war dead, and so presumed Charles Comerford from Brighton Road, Rathgar, tenth from the top on the first list on the left, had died in World War I. When I posted this on my family history website, his descendants quickly got in touch ... and also helped me to fill out details about another branch of the family. So, even misreading parish records can open new possibilities and help to fill out the full story. The Revd Canon Patrick Comerford is Lecturer in Anglicanism, Liturgy and Church History, the Church of Ireland Theological Institute, an Adjunct Assistant Professor, Trinity College Dublin, and a canon of Christ Church Cathedral, Dublin. This lecture in the National Library of Ireland on 5 August 2014 was part of Eneclann and Ancestor Network’s programme of “Twentyx20” lunchtime talks unlocking the richness of Irish family history. Each talk is a short introduction to a key area, essential source or genealogy research method, followed by a Question and Answer session with the expert. I attended your lecture today and I have to say it was one of the most interesting lectures I have ever attended. You are brilliant, a pleasure to listen to. You 'flow' - you love your topic. I am the lady who said 'I do gravestones' - that is I transcribe them and put the information on the net. A friend of mine from Durrow emailed me from the US telling me that your lecture was on today and I am very glad I attended. It was a most enjoyable afternoon, and it was a pleasure to find so many enthusiastic people there this afternoon. May I add my appreciation for this fascinating lecture? 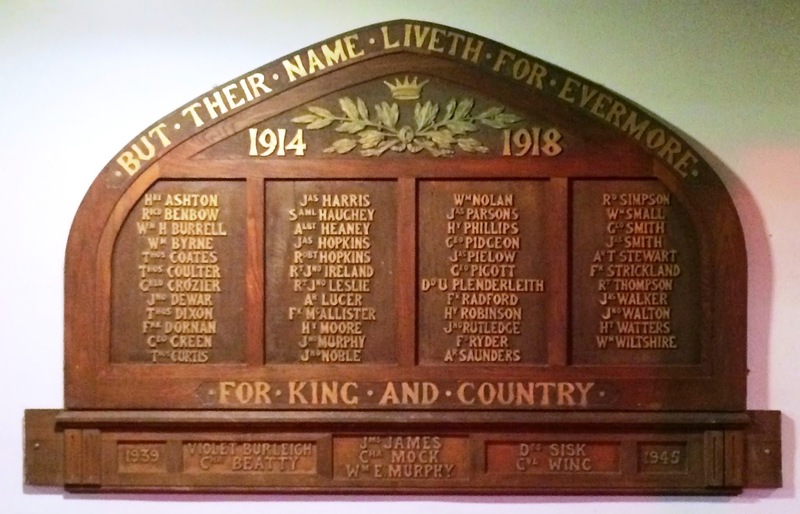 There is a splendid World War I memorial in St. Mary's, Haddington Road. 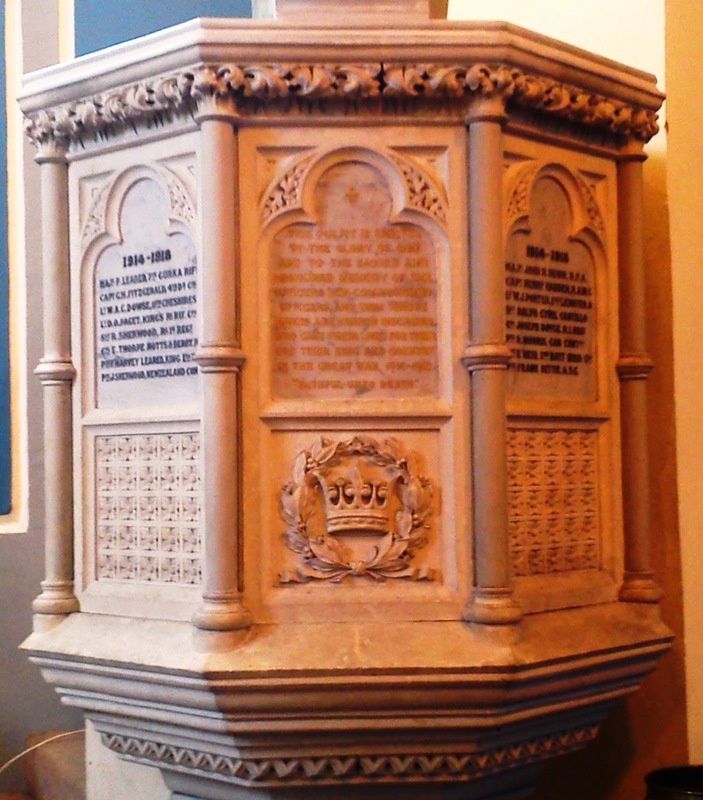 It would be interesting to know whether this is a unique instance of a parish WW I memorial in a Roman Catholic Church in Ireland. I do not know of any others. masterpiece, an Enniscorthy on a bigger scale).